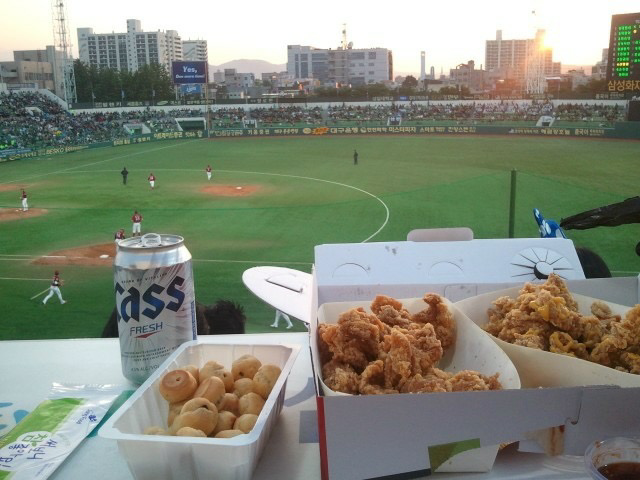 Spring has come and it is the best time to go outside and watch a Korean baseball game. 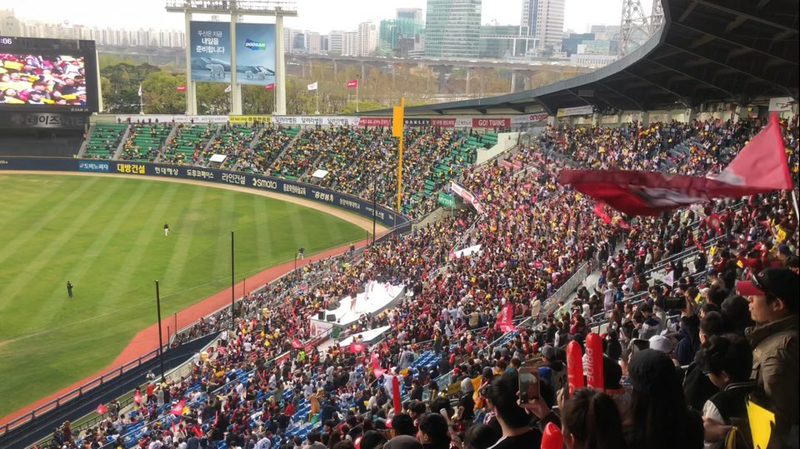 Baseball, along with soccer, is a popular sport in Korea. It is loved by many people regardless of their gender, age, or religion. People come to baseball games because there are many attractions and activities that they can enjoy while cheering for their team. Korean baseball has an especially well-developed culture in which fans cheer for their team. Cheerleaders perform on stage while fans shout out their team’s fighting song to support the players. Each player has his own fighting song, which makes it more fun for the audience to cheer. The melody of a typical song is very easy and addictive for foreigners to learn as well. Secondly, special events like kiss time and dance time raise people’s interest. Baseball games have a lot of intermittent break times between the innings (switching of between offense and defense). Hence, supporters of each team organize these events. During Kiss Time, a camera shoots at a couple. If the couple kisses, they receive a small gift. Similar rules apply to dance time. Eating snacks is another highlight of watching a baseball game. New stadiums usually sell a wide array of snacks. The most popular and well-known snack is chicken and beer. Some people bring their own food for the game. The easy way to purchase alcohol is to buy it from a beer boy walking around. He carries a tank full of beer and sells a cup for a few thousand won. 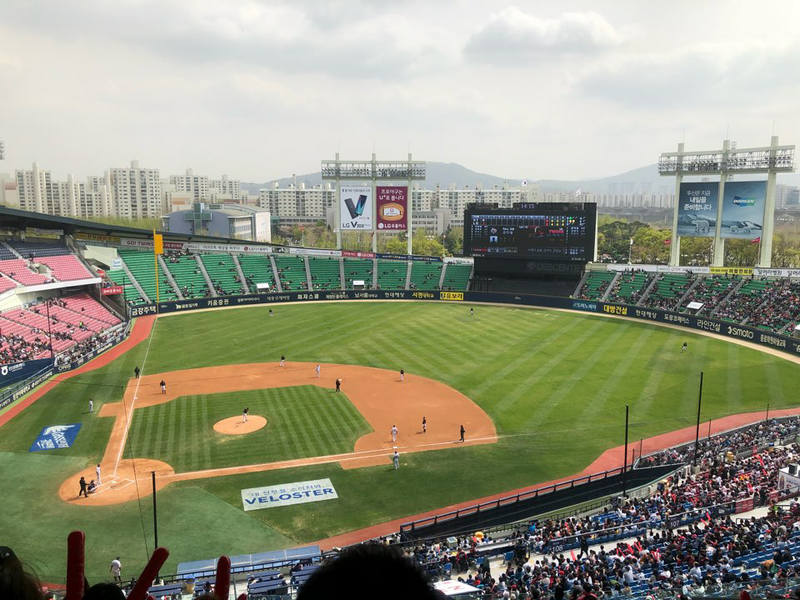 Korean baseball teams constitute of 10 teams: LG Twins, Doosan Bears, KT Wiz, SK Wyverns, Lotte Giants, Nexen Heroes, Samsung Lions, Hanwha Eagles, NC Dinos, and KIA Tigers. Each team owns a stadium and offers great services to guests. The biggest is the Seoul Jamsil Baseball Stadium, which is the home ground of the LG and Doosan team. The closest to where we live is the Incheon Baseball Stadium, which also offers great services. Games are held six days a week except for Monday, but the match time differs each day. The game starts at 6:30pm on Tuesday, 5pm on Saturday, and 2pm on Sunday. Please refer to this schedule when attending a game. Watching baseball with your friends, loved ones, and family can make unforgettable memories. If you do not know about the rules of baseball, visit the link below to learn more about baseball.